Traditional calacas are commonly used as decoration during the Day of the Dead. Halloween might be just around the corner, but October 31st is also the beginning of another celebratory holiday. Día de los Muertos, otherwise known as the Day of the Dead, is a multi-day tradition celebrated in Mexico, Central America, South America, and Latino communities throughout the world. 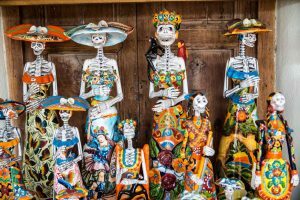 Discover the basic customs of Día de Los Muertos, and other important things you should know about the annual holiday. Ancient Aztec beliefs dictated that the gates of heaven opened at midnight on October 31, and the spirits of the deceased were allowed to reunite with their families. As a result, Día de los Muertos is a celebration of life, rather than a commemoration of death. The three-day festival is filled with music, dancing, and other lively traditions. In Southern Mexico, holiday participants build altars inside of their homes to honor deceased loved ones. Often decorated in vibrant hues of oranges and purple, these altars are covered in ofrendas (offerings) such as candles and flowers. Ofrendas are often specific to the tastes of the deceased and can vary from small toys to packs of cigarettes. These beautiful, bright orange flowers are commonly found on altars and inside of homes throughout Día de los Muertos. Mexican marigolds only flower during the rainy season and celebrants believe that they help guide their loved one’s soul back to the world of the living. Small, skull-shaped treats known as “sugar skulls” are traditionally used to decorate the ofrendas. They’re made of granulated white sugar mixture and pressed into special skull molds. Once dried, the sugar skull is decorated with icing and colored foil. Sugar skulls have since expanded into pop culture, and serve as a global representation of Día de los Muertos. Festival celebrants are commonly found wearing face paint to depict calacas (decorated skeleton figurines). Celebrate the Day of the Dead with AESU! AESU offers several trips to Spain, including Discover Spain Games of Thrones Tour, Euro Explorer and Continental. Explore Spain and its spectacular landscapes. This entry was posted on Wednesday, October 11th, 2017	at 9:02 am	. You can follow any responses to this entry through the RSS 2.0	feed. Both comments and pings are currently closed.